Klaus Regling and Michael Noonan at the Department of Finance today. FINANCE MINISTER MICHAEL Noonan has said that any active pursuit of retroactive recapitalisation of Ireland’s banking system cannot be done until 2015. Noonan was speaking after a meeting with the head of the eurozone’s permanent bailout fund, the European Stability Mechanism (ESM), Klaus Regling who repeated his belief that he currently cannot foresee unanimous consent to Ireland getting a deal on its bank debt. The government has been pushing for the use of the ESM to retrospectively recapitalise its pillar banks, AIB and Bank of Ireland, which received billions of euro in State funding at the height of the financial crisis. Crucial to any retroactive recapitalisation is the establishment of a Single Supervisory Mechanism for the eurozone which is not likely until November of this year. 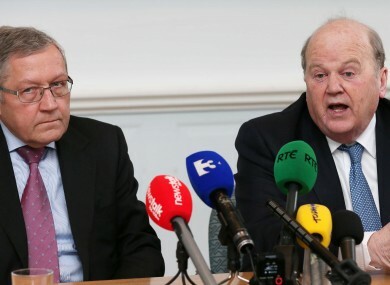 “We’ll continue to pursue retroactive recapitalisation of the banks and we will do that actively as soon as the instrument is in place, which means 2015, and at all levels in government we will pursue that as an objective,” Noonan said. The Minister reiterated the commitment made by European leaders on 29 June 2012 to break the link between the banking debt and the sovereign and said this had been reinforced by subsequent statements from the French and German leaders. Noonan said that the State is “not going to wait around” for a deal and will continue to bring down its cash buffers as well as purse any possibilities to sell its estimated €11-12 billion worth of shares in the banks. “We’re not flying on one wing and simply waiting for European assistance. We have an active policy for dealing with our debt as well.,” the said. Regling congratulated Ireland on its recent emergence from the Troika programme but said that this successful exit did not mean that it would be more difficult for Ireland to get a bank debt deal. He said that although he does not see consensus on giving Ireland debt relief there are “many other developments [that are] moving in the right direction and will help reduce the debt burden for the Irish economy and the Irish budget”. Email “Noonan says bank debt deal cannot be 'actively' pursued until 2015”. Feedback on “Noonan says bank debt deal cannot be 'actively' pursued until 2015”.